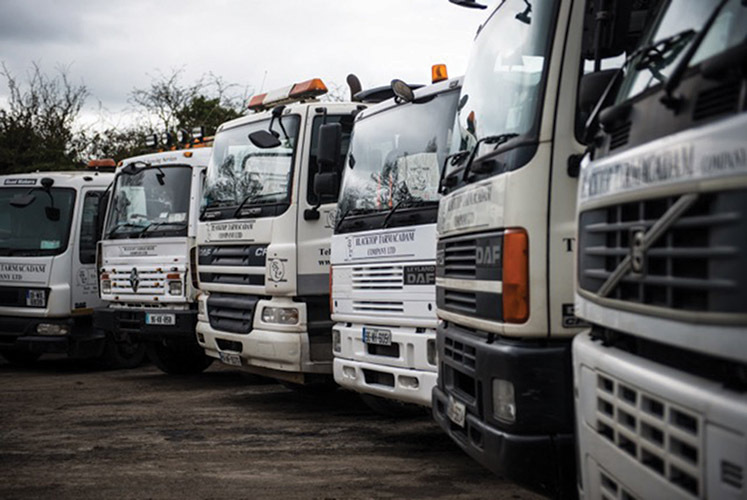 Specialising in tarmacadam and asphalt works, Blacktop Tarmacadam Co. Ltd. has been providing unrivalled solutions to an ever-increasing number of satisfied customers for over two decades. We caught up with managing director Kevin Bissett to get an insight into the exceptional County Meath based family business and to discuss the full range of services provided by their specialist fleet and professional personnel. Simply put, Blacktop Tarmacadam is one of Ireland’s premier tarmac companies. 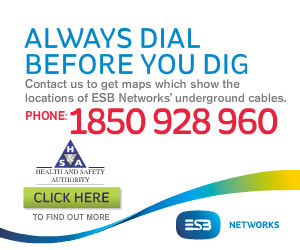 As a subcontractor for the country’s major road constructions companies, they have carried out works for various construction companies and local authorities throughout Ireland. In addition to major road works, they also specialise in smaller projects such as car parks, housing estates, industrial units, house fronts etc. No job is too big or too small and a complete service is provided from start to finish, including white lining. One of the many areas in which the Duleek-headquartered company boasts a stellar reputation near and far is tack coat spraying - a process which is carried out to NRA specifications and involves the spraying of bituminous emulsion to bind wearing course to the base course layer, or to bind new and old material when overlaying. Their fleet of ten tack coat sprayers is available for work nationally managed by Adrian Hillman Some of the major contracts that have benefited from this service include the M50 and the Castleblayney bypass in County Monaghan. Meanwhile, cold milling machines (planers) are designed to remove defective materials to the required thickness so that they can be replaced and the carriageway repaired. These are also used to remove strips of asphalt pavement so that supply lines can be installed in trenches, thus ensuring that the time required for road works is kept to a minimum. For effective and efficient planing, Blacktop can supply planer, truck and sweeper as a package at a competitive rate. Blacktop Tarmacadam also have several paving machines available for hire – with or without a driver - including BB760, BB650, BB632 and Antec 3500. Blacktop Tarmacadam Co. Ltd. boast twelve years’ experience in Stamped Asphalt, which can produce an authentic stone-look onto an asphalt base, offering a cost-effective alternative to brick, stone and slate while maintaining the same look. Stamped Asphalt is attractive, durable and affordable and delivers a great look to homes, communities, shopping centres and parking areas. Operating out of Duleek in County Meath, Blacktop Tarmacadam Co. Ltd. has been providing an unrivalled service for more than two decades. Reflecting on the genesis of this exceptional family-run operation, managing director Kevin Bissett notes: “My father Christy, my brother David and I have worked in tarmacadam for many years and in 1993 we started up the company. It’s very much a family business with seven family members involved. Christopher Bissett Senior has since retired but is still involved as a consultant, while David now runs Blacktop Down Under in Brisbane. We shipped two paving machines over and started up Blacktop Downunder over there, and I took over this business on my own. “I started in tarmacadam in 1980, having learned from my father, and we have a good few years’ experience now. My own sons Christopher Jnr. and Jason are involved as well as my brother Thomas who manages our Planing Division and nephew Blake, who has just joined. We even have two lads who have been working here since ’93, which speaks for itself. They’re good lads and we’re very happy with them. A quick glance at the client list tells us all we need to know about the high esteem in which the Duleek-based company is held in the industry. As well as assorted County Councils (including Meath, Fingal, Dún Laoghaire-Rathdown, Monaghan and Kildare), Blacktop Tarmacadam also work in conjunction with all the major road construction companies, including Lagan Asphalt Group and Roadstone. Most of our subcontracting works are for Lagan Asphalt, we also provide a service to Roadstone and Kilsaran on a smaller scale“ Kevin confirms. “a substantial amount of our work – between tackcoat spraying and laying tar – is with Lagan Asphalt. “At the moment, we’re doing a lot of car parks and small roads as well as private driveways, lanes and footpaths etc. We provide a one-stop solution including dig-outs, kerbing, drainage – the whole lot. We can also do ‘street print’ on driveways. We have the machinery and the personnel to do any job … we’ll look at them all! At the heart of the operation is the superb fleet. “The fleet is critical,” Kevin acknowledges. “We have a total of 22 vehicles on the road between lorries, vans and sprayers and we can work on four projects at a time, using four crews of six men. Of course, the period from 2007 up until last year wasn’t exactly a prolific one when it came to roadwork’s in Ireland. “It was very difficult,” says Kevin. “We lost money in two of those years and it became very difficult to keep the business going. With significant cost cutting measures and tight budgetary controls, restricted capital expenditure and monthly management accounts, all implemented in recent years by the Finance Director Patrick J Hoey contributed to our much improved financial position. Timely management information is one of the key ingredients to controlling costs. I would like to commend all our staff for the great effort they put in during these difficult economic times." Looking to the future, Kevin intends to keep the sleeves rolled up: “I’m looking over my shoulder here,” he quips. “Christopher Jnr. is contracts manager now and Jason is in charge of all the tar crews on site, the family are slowly creeping up through the ranks. No doubt they’ll throw me out one day! But I’m still only 52 and my enthusiasm for the business is still as strong as it was in the beginning. That’s exactly why Blacktop Tarmacadam Co. Ltd.’s reputation for excellence precedes them!